You've found the “U.S. 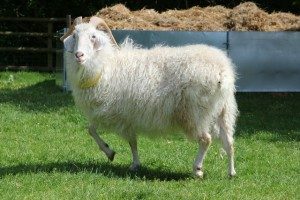 Angora Goat Breeders” page here at Hobby Farm Wisdom! If this is the first time you have visited our site: Welcome! Angora goats are a domestic goat breed that comes from Angora in Asia Minor. Angora goats are a smaller animal compared with sheep or other goats, with both sexes naturally horned. They have heavy, droopy ears and a similar form to sheep. There most desirable quality is their mohair, which is extremely valuable and has the same chemical composition of wool but is smoother and very thin. Currently, Turkey, Argentina, the United States and South Africa are the largest producers of mohair. Most often, Angora goats are bred for their white coats but other colors such as black, brown and red have appeared. Angoras are one of the most delicate domestic animals; they are very susceptible to parasites and cannot handle cold temperatures well. They also have high nutritional requirements in order to maximize mohair production.